Maybe you've earned your certificates and ratings in as little as 350 hours and you have your sights set on an airline job. However, many of these pilot jobs require at least 1,000 hours, and others require multi-engine and turbine time. So, how exactly does a newly certificated pilot gain these hours? There are multiple ways to do it. Banner-towing might not be a glamorous job, but it's a job—and one with lower hour requirements than other jobs. 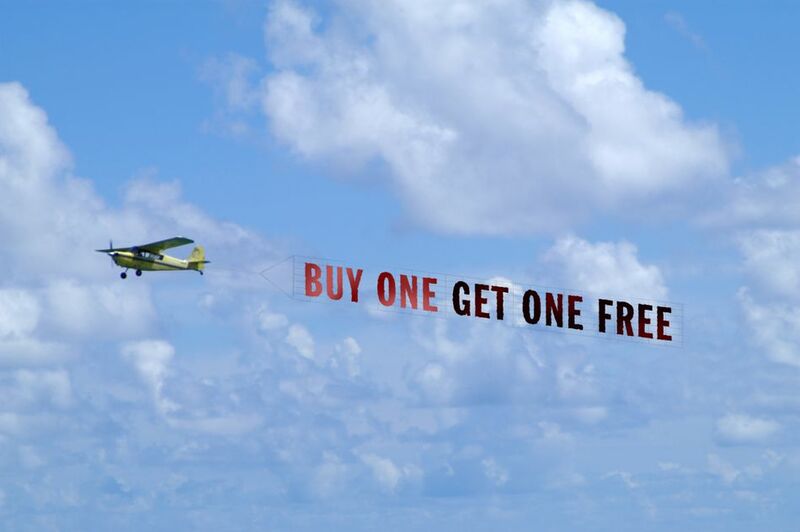 Banner-towing pilots are highly skilled and often fly around water, beaches, and sporting events. If you're in an area with numerous glider operations, you might consider becoming a tow pilot. Towing gliders is also a great way to hone your skills, as the tow pilot must fly his own aircraft safely in addition to being ultra-aware of the glider's flight characteristics and performance. For pilots with a commercial pilot certificate, flying skydivers is a popular option in order to build hours. Like tow pilots, jump pilots must be adept at multi-tasking and must remain focused at flying safely and keeping the jumpers safe at all times. It can be a demanding job. A more routine job for fresh commercial pilots might include flying a tour plane. Tourist areas like the Grand Canyon or ​the Hawaiian Islands are popular places for sightseeing flights—and for new pilots to gain hours—but that doesn't mean these are the only places that offer sightseeing flights. Search the region where you live for similar opportunities. Aerial photography isn't as common as some of the other time-building methods, but for those that do fly for an aerial photography operation, it can be a rewarding and boring job. As an aerial photographer pilot, you'll likely fly low and slow over customer's properties, buildings, and landmarks. Some aircraft are specially modified for photography while others require the photographer to open a window or take the shot through the window. If you've ever heard a pilot say that he "handed over his paycheck for Hobbs time," then you know it's one of the more popular (and slow) ways to gain flight hours. But working at an airport means you might get a discounted rate on flight rental and even instruction time, so it's a good way to fly for cheap. Hanging out at the airport is one of the best ways to get free flight time, especially for new private pilots. Often, pilots and aircraft owners are just looking for someone to keep them company, and they'll offer you a ride if you happen to be hanging around during the preflight. Private pilots, commercial pilots, flight instructors, and even corporate pilots are known to offer the second-in-command seat to someone willing and able to fly with them. But you have to be in the right place at the right time, which is why being an airport employee can be beneficial. As a bonus, hanging around the airport not only gets you hours, but it might get you hours in really cool aircraft. You know that old man who's been working on the P-51 in the hangar for the past 6 months? He'll be eager to show it off to other pilots when it's ready to be test flown. That businessman with the Cessna 182? He'll need a safety pilot when it comes time to get current. Your pilot friends will need safety pilots from time to time to fly with them for currency reasons, but many pilots just want a second pilot with them while they fly around as a second pair of eyes. If you're a good pilot and a nice person, you'll get invited to go on flights with pilot friends. Maybe they're going out for a weekend flight to grab a $100 hamburger. Or maybe one of them is going on a solo cross-country flight to visit family. You'll log a few hours this way if you're nice to people. Sharing flight time can be difficult in a remote area, but if you're in an area with a semi-large flight school, you should have no problem finding someone who is willing to share flight expenses. You can both log the time, but the bill is cut in half—a nice bargain if you're out flying around anyway. Military flying isn't the right option for every pilot, but for those who are willing and able to work hard and sacrifice a few years of their lives to live at the whim of the military, it's a great option. If the airlines are your goal, then a military flying career will get you there easily. Air Force pilots learn valuable life skills along with gaining that valuable turbine pilot-in-command time that's so highly sought after by airlines. In the meantime, you'll travel the world at the controls of some really cool airplanes.